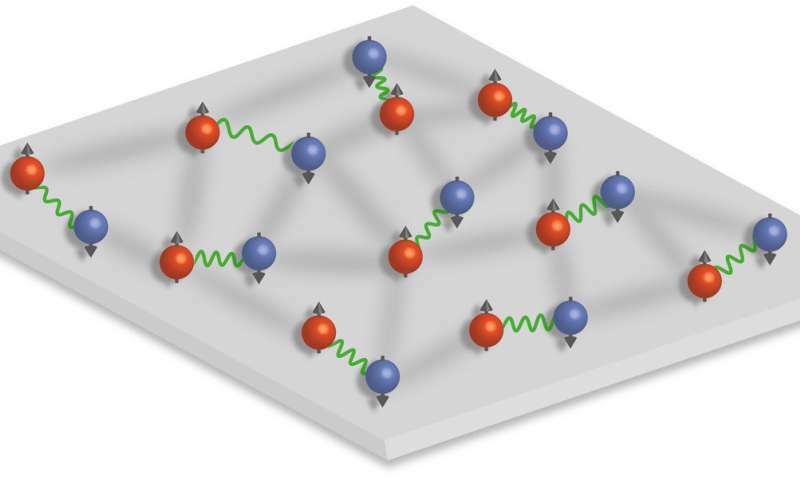 Using ultracold atoms, researchers at Heidelberg University have found an exotic state of matter where the constituent particles pair up when limited to two dimensions. The findings from the field of quantum physics may hold important clues to intriguing phenomena of superconductivity. The results were published in Science. Superconductors are materials through which electricity can flow without any resistance once they are cooled below a certain critical temperature. The technologically most relevant class of materials, with exceptionally high critical temperatures for superconductivity, is poorly understood so far. There is evidence, however, that in order for superconductivity to occur, a certain type of particles – the fermions – must pair up. Moreover, research has shown that materials which become superconducting at relatively high temperatures have layered structures. "This means that electrons in these systems can only move in two-dimensional planes", explains Prof. Dr. Selim Jochim of Heidelberg University's Institute for Physics, who heads the project. "What we did not understand until now was how the interplay of pairing and dimensionality can lead to higher critical temperatures." To explore this question, researchers at the Center for Quantum Dynamics performed experiments in which they confined a gas of ultracold atoms in two-dimensional traps which they created using focused laser beams. "In solid-state materials like copper oxides, there are many different effects and impurities that make these materials difficult to study. That is why we use ultracold atoms to simulate the behaviour of electrons in solids. This allows us to create very clean samples and gives us full control over the essential system parameters", says Puneet Murthy, a Ph.D. student at the Center for Quantum Dynamics at Heidelberg University and one of the lead authors of this publication. "To achieve our ultimate goal of better understanding these phenomena, we will start with small systems that we put together atom by atom", says Prof. Jochim. Nothing like exotic dancing atoms. I wonder if they dance around poles. Does this have anything in common with excitonium?